The coins found in Caesarea. The Israel Antiquities Authority (IAA) announced the discovery of a number of gold coins that date back to the crusades, and are thought to be connected to “one of the most dramatic events in the history of Caesarea,” Israel. 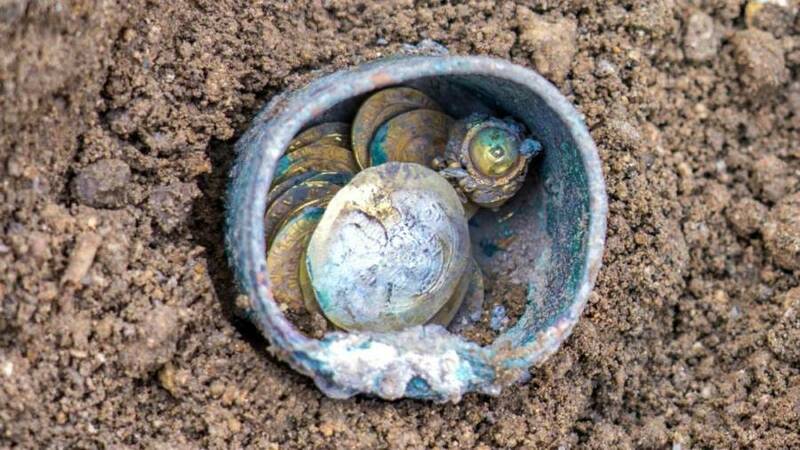 A total of 24, rare, gold coins were found in a bronze pot between some stones in the side of a well within the port city. Along with the estimated 900-year-old coins was a single earring. It’s thought that the coins were hidden by someone who hoped to retrieve them but never returned, potentially due to a premature death at the hands of the crusader army. Indeed, archeologists believe that the owner of the coins may have died during the crusade on Caesarea in 1101. “The coins in the cache dating to the end of the eleventh century, make it possible to link the treasure to the Crusader conquest of the city in the year 1101, one of the most dramatic events in the medieval history of the city,” said dig leaders Dr. Peter Gendelman and Mohammed Hatar of the IAA. Most of the inhabitants of Caesarea were massacred by the crusader army of Baldwin I, king of the Crusader Kingdom of Jerusalem. It’s therefore not a stretch for archaeologists to assume that the owner of the coins and earring was either murdered by the crusades or sold into slavery. 18 of the 24 gold coins that were discovered are Fatimid dinars, which was the standard local currency that was used in Caesarea at the time. The other six coins are rare imperial Byzantine coins that are believed to have been minted sometime around 1071–1079 A.D. The city of Caesarea was controlled by the Byzantine empire and then fell under the control of the Arabic Caliphates between the second and 11th centuries. Caesarea was under Christian control once again after the Pope-supported Germanic Crusades attacked the city in 1101. The press release surrounding the discovery on Dec.3 also happened to be on the first night of the Jewish celebration of Hanukkah. Children who observe the holiday were traditionally given money, or “gelt,” but today are gifted chocolate coins wrapped in gold foil, which makes the discovery particularly serendipitous. “It is symbolic that the gold coins were discovered on the eve of Hanukkah. For us, this is certainly ‘Hanukkah gelt,'” said Michael Karsenti, CEO of Caesarea Development Corporation that helped co-lead the dig. A view of the dig site in Caesarea. 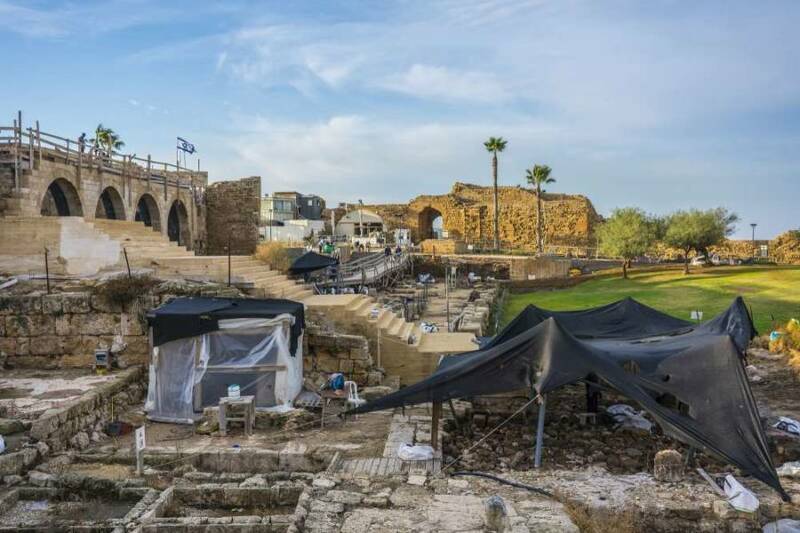 Archeologists are continuing the dig in what is now known as Caesarea National Park. This latest discovery will reportedly remain on public display at the Caesarea Port for the duration of the eight-day Hanukkah festivities.